Image caption Amnesty cited Mr Trump's "poisonous campaign rhetoric"
Politicians who have used a divisive and dehumanised rhetoric are creating a more divided and dangerous world, says rights group Amnesty International. 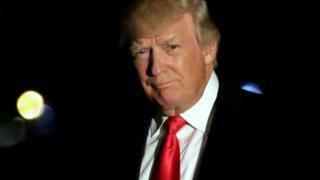 Its annual report singles out President Donald Trump as an example of an "angrier and more divisive politics". But it criticises other leaders, including those of Turkey, Hungary and the Philippines, who it says have used narratives of fear, blame and division. The group also says governments are exploiting refugees for political ends. The report, which covers 159 countries, cited a rise in hate speech across the US and Europe targeting refugees and said the reverberations would see more attacks on people on the basis of race, gender, nationality and religion. It criticised countries that, it said, once claimed to champion rights abroad and that were now rolling back human rights at home. "Instead of fighting for people's rights, too many leaders have adopted a dehumanizing agenda for political expediency," Salil Shetty, secretary general of Amnesty International, said in a statement. "The limits of what is acceptable have shifted. Politicians are shamelessly and actively legitimizing all sorts of hateful rhetoric and policies based on people's identity: misogyny, racism and homophobia." The group made special reference to Mr Trump's executive order last month that banned refugees and immigrants from seven mostly Muslim countries from entering the US. It said Mr Trump put "his hateful xenophobic pre-election rhetoric" into action by signing the measure. The US president, who recently said he was the "least racist" and "least anti-Semitic person", is expected to unveil an updated order this week. Amnesty also mentioned Philippines President Rodrigo Duterte, Turkish President Recep Tayyip Erdogan and Hungarian Prime Minister Viktor Orban as leaders who were using the "us versus them" rhetoric. "2016 was the year when the cynical use of 'us vs them' narratives of blame, hate and fear took on a global prominence to a level not seen since the 1930s," Mr Shetty added, citing the year when Adolf Hitler rose to power in Germany. "A new world order where human rights are portrayed as a barrier to national interests makes the ability to tackle mass atrocities dangerously low, leaving the door open to abuses reminiscent of the darkest times of human history." Kate Allen, director of Amnesty UK, criticised as "shameful" the recent decision by the British government to halt the scheme which allowed the entry of unaccompanied refugee children already in Europe, estimated to be 90,000. The London-based group exceptionally launched its report in Paris, saying that France has seen an erosion of its rights in the name of security. The French government says its measures, which followed a series of attacks in 2015, are necessary to protect the country.